To those with no known grave. They live in hearts that love them well; their grace their country's story. On the night of 5th/6th July 1944, the Hudson aircraft, piloted by my uncle, Flt. Lt. J.W. 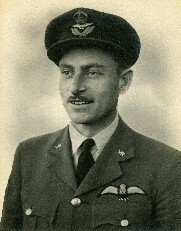 Menzies DFC (knownto the family as Ian) failed to return from a mission "over enemy held territory". I hope that through this site I can accord all those on board the aircraft that night the recognition which they so richly deserve. At the same time, I also wish that the story will give hope to those relatives of so many airmen who have no known grave and are remembered, with honour, at Runnymede Airforces Memorial. When, in 1985, I inherited Ian's medals I set out, somewhat half-heartedly, to trace his career with the RAF and, if possible, discover what he and his crew had been doing when they were reported missing. Little did I know that the search would take in excess of sixteen years to produce a fantastic result and, in many ways, still continues today. In 1997 the wreck of Ian's aircraft was recovered from the IJselmeer, in Holland, and human remains were found in the cockpit. A positive identification was made in 1998 and, in October that year, Ian was laid to rest, with full military honours, alongside his crew who had been found drowned in 1944, shortly after the aircraft went missing. In 2001 the German Air Gunner who shot down the aircraft was traced. A short interview with him filled in many of the gaps in the mystery yet, at the same time, raised even more questions. The search for all the answers continues. This site is visited by people from all walks of life and all parts of the world. Some are veterans of the "Secret Squadrons", and some are relatives of those who served with the Squadrons, as well as those with a more general interest in RAF and SOE history. Please take a moment to read/sign the guestbook. Thank you.